Lumileds launched a new version of the LUXEON 2835E 9V LED specifically optimized for the typical drive current of retrofit lamps and downlights, 100 mA. Lamp designers will achieve a 5% boost in efficacy over the 60 mA LED when driven at the same current, leading to more efficient retrofit lamps including A19, PAR and B11 lamps. Forward voltage drops by 4% as well. For instance, at 2700K and 80 CRI, the LUXEON 2835E 9V produces 118 lm and achieves 127 lm/W at 9.3V (versus 120 lm/W at 9.7V). “The LUXEON 2835E is extremely popular for retrofit lamps because of its high efficiency and compact package. Now with a drive current closer to operating conditions, customers get the most relevant spec for output and efficacy,” said Mei Yi, Product Manager of Mid Power Products at Lumileds. The LUXEON 2835E also can be driven at up to 150 mA, with a junction temperature of 125°C for reduced LED count in compact designs. 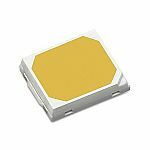 The LUXEON 2835E LEDs are available in a wide range of color temperatures and minimum CRI of 70 to 90. The LEDs are hot color targeted, ensuring the color remains inside ANSI bin specifications at typical operating conditions. Design kits are available to meet to 3-, 4- and 5-step MacAdam ellipse color consistency.